A mass protest march and rally will take place on Sunday, May 20, beginning at 12 noon at the Petrillo Band Shell in Grant Park. At last count, the protest has been endorsed by over 130 organizations from around the United States and Canada, plus prominent individuals such as the Rev. Jesse Jackson. The Coalition Against NATO/G8 War & Poverty Agenda (CANG8) is organizing the event. The umbrella group was formed last summer by some 80 organizations, including the United National Antiwar Coalition (UNAC), which put out the initial call for the protest. Protesters already have won a couple of victories. In March, President Obama announced that the G8 summit, which had been scheduled to precede the NATO meeting in Chicago, would instead be shuffled into the confines of Camp David. The G8, composed of heads of state from the eight “major” industrial nations (without China), will thus be allowed to meet in a fortress in the Maryland woods—far away from protesters and the eyes of the public. And in early May, after months of waging a vigorous national campaign for the right of free speech, CANG8 was informed by the city of Chicago that they would be given a permit for the May 20 rally to take place at a location not far from the NATO meeting. The rally organizers had demanded a rally site “within sight and sound” of the summit; the site they were given, as a compromise, will be three blocks away. Nevertheless, security arrangements in Chicago are being handled in a manner that seems deliberately calculated to try to scare away potential protesters, or at least to isolate them and minimize public exposure to their message. For example, the Milwaukee area branch of the American Red Cross told the media in late April that the Secret Service and Chicago authorities had asked them to prepare shelters for a mass evacuation from Chicago! In early May, the U.S. Secret Service released security plans that specified that major roadways, tourist attractions, and parking lots would be closed. Closures would affect areas from O’Hare International Airport to downtown Chicago. Chicago museums were considering closing their doors. Several banks announced they would shut their branches, while one downtown office complex urged corporate execs to try to avoid hassles by “dressing down” to blend more easily with protesters on the street. It is expected that representatives from over 60 countries will attend the NATO summit, though the conference will naturally by dominated by the United States and its close imperialist “partners.” The main item on the agenda will be the U.S./NATO war in Afghanistan. The slogan put forward by NATO officials is “in together, out together” from Afghanistan—meaning that they are hoping that none of the European powers with troops in the country will withdraw them until the agreed-upon date of 2014. The United States needs all the help it can get from its European allies in the Afghanistan war. The Hamid Karzai regime in Kabul has proven corrupt and deeply unpopular, and Afghan troops will hardly be able to take over military responsibilities from the U.S. occupiers anytime soon. But the European governments, beset by economic crisis, are finding strong grassroots opposition to their continued participation in the Afghan morass. President-elect François Hollande of France has stated that his country’s troops would be withdrawn at the end of this year. Accordingly, both President Obama and NATO Secretary General Anders Fogh Rasmussen have scheduled appointments with Hollande before the NATO summit in order to try to draw him back in the fold on the Afghanistan question. Hollande, for his part, has noted that he would “not make things difficult for Barack Obama.” In a May 7 news conference, he praised Obama on foreign policy and said that he also saw potential areas of agreement with Obama on economic issues. Europe’s economic difficulties provide the background for both the NATO and the G8 meetings. There are more and more signs that the euro zone as a whole is falling into a new recession; unemployment in Western Europe is at its highest point in over a decade. Britain has recently joined half a dozen other European nations in entering a double-dip recession (two successive quarters of negative growth). Government austerity policies have served to augment the economic slowdowns and unemployment throughout Europe. France’s President-elect Hollande has tried to allay anxieties over the renewed crisis with talk of restoring government “growth” policies—subsidies to boost production, a slight expansion of the social safety net, and higher taxes on the wealthy. But he appears to be on a collision course with other EU leaders over his plan to renegotiate the bloc’s fiscal pact. German Chancellor Angela Merkel has warned that reopening talks on the pact, endorsed by 25 EU governments in March, would be impossible. These are some of the inter-imperialist tensions that the G8 meeting will have to sort out, which also carry over into NATO. The G8 and NATO summits will also explore, of course, the interests of the imperialist countries in increasing their exploitation of Africa and other areas of the neo-colonial world—and how they might share the booty. Accordingly, the heads of state of four African states—Ghana, Benin, Tanzania, and Ethiopia—have been invited to sit as guests at the G8 Camp David meeting. One item on the agenda will be “food security” concerns, which will no doubt involve wrangling over how to best allow Western countries to dump their subsidized food surpluses into African countries that have seen their own agricultural resources remolded for the purpose of mono-crop cultivation for export. In contrast to the wheeling and dealing of the imperialists will be the People’s Summit in Chicago. People who are opposed to the pro-war and anti-people policies of the corporate rich are invited to take part in their own conference, on Saturday and Sunday, May 12-13—one week before the May 20 mass march. There will be large plenary sessions as well as more than 40 workshops to provide everyone the opportunity to engage in dialogue about the pressing issues facing the world. Speakers will include Malalai Joya, former Afghan member of parliament and internationally renowned opponent of NATO’s occupation of Afghanistan; the Rev. Jesse Jackson, Rainbow/PUSH coalition; Reiner Braun, International Coordinating Committee of the European No to NATO network; Kathy Kelly, Voices for Creative Nonviolence; death row prisoner Mumia Abu Jamal via speakerphone; Malik Mujahid, Muslim Peace Coalition; Medea Benjamin, Code Pink; and Col. Ann Wright (ret. ), antiwar activist. All Out to Chicago! No to NATO and War! 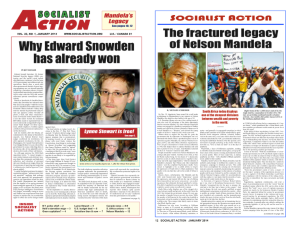 > The article above was written by Michael Schreiber, and first appeared in the May 2012 print edition of Socialist Action newspaper. NATO & G8 to meet in Chicago — Support the right to protest!